We are en route on our way home. We were in clinic a little longer than expected, so after getting back to the camper and hooking up, we got a late start. We will be making a stop in Ohio tonight soon to rest and then staying in Pittsburgh tomorrow night. It's been hard because we haven't had internet to really update, so I apologize. But I do have to tell you, the camp Host at KOA was a great lady and was wonderful to work with. Thank you Theresa for being a great host. Emily had her MIBG scan yesterday and did pretty well. Her head was really hurting from the way she was laying, but she did well. Yesterday we thought she would have to go to clinic after MIBG scan, but she didn't so it was nice to go back and hang out at the camper and nap and enjoy time with kids. We had heard from Shannon, the nurse practitioner who was wanting Emily to get GCSF, we couldn't understand why she wanted it. So we waited to talk with her today about it. We did get preliminary results from yesterday's scans yesterday as well, but didn't have everything back. She asked that Emily be in clinic at 8 before scan to check counts and see how things looked. Today She had her PET scan today and as always rocked it. Thankfully her glucose was fine this time and didn't cause a delay like it did in January. Shannon called with her counts and thankfully her platelets looked good from her Wednesday transfusion, hemoglobin is dropping and her ANC on Wednesday was 210 today it was 0! Shannon said Dr Sholler would really like for Emily to get GCSF/neulasta shot because her bone marrow right now is not making anything, it is less than 5%. She said this is very dangerous and they would feel better that she have it. She did state again, please take Emily in to the hospital if she has a fever over 100.4 since we are driving. PET scan went well and she handled it well. We went back to clinic after scan, and talked with Shannon. Scans are stable with some spots brighter/more density. They feel there is more density because her VMA in January was 8.2 and it has gone up to 11.2. We should have results from PET scan Monday hopefully. If they are negative like they were before, like we were told before we know there is still cancer in her body based on numbers and scans. After talking with Shannon, we decided it was best for Emily to get neulasta. Emily's bone marrow is not making any cells and they could see that from the bone marrow biopsy/aspirates. Dr Sholler was notified of this and she too was concerned. Shannon also explained that when looking to see if they were positive for MDS and NB, they only had less than 5% of her cells to look at them, so depending on how things go she may order another one when she needs to be back in 8 weeks. We are still waiting for the final results of the bone marrow and for the cellularity and the cytogenetics. We wanted to head home and have stem cells given back to her but we need to wait on the final results to know if giving her the cells would even work at this point. If we gave them to her and some things don't look good, it wouldn't work. The final results which we are nervous about, can tell us if she has pre leukemia or anything else going on in the marrow. Stable is good. We honestly have adjusted to hearing stable because that is what we normally hear, but it's positive when there is no new disease. It's still heartbreaking when you just want to hear those 3 magical words. One day, we continue to believe, one day. HOPE! Right now and for a while she doesn't qualify for any therapy because her bone marrow has been hit to hard. Shannon stated Emily should not have been on the chemo with the way her marrow looked, but who would have known since we didn't have a bone marrow since last year. It's scary to think, but this is why Emily had a neulasta shot before leaving the clinic today. We started DFMO in clinic today and Emily is happy to know that she is no longer on chemo for now. Her body/bone marrow needs a rest. Emily showed Shannon she could take 2 pills at the same time. 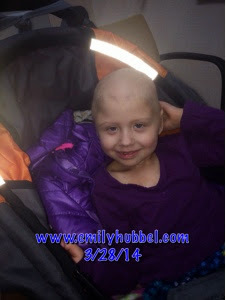 We went over everything again, and when Emily needs to be seen in clinic at home to get labs and physical done. We also have to make sure that if Emily has to go in the hospital for anything that the doctors let Michigan know in real time what is going on because this all has to be reported to the FDA since the drug is provided by the FDA. Right row Emily will still continue to make 2 a week trips to clinic at home until her counts have recovered. It's most likely she will need blood come Tuesday when she has clinic. And again since her ANC is bottomed out, if any fevers we are to head to the closest hospital. Please hope for no fevers. Please continue to send your thoughts and love that everything comes back with good results. Emily needs a rest from treatment/hospital visits/clinic. She wants to return to school, she wants to do some "normal" things! Remember to hug and kiss your kids everyday and tell them how much you love them. Things can change quickly. Thank you to all for continuing to be a part of her journey and spreading awareness of childhood cancer. Thank you for the update on Emily. Continuing to cover her in prayer for NED.